Tideline is a quarterly newsletter published by the San Francisco Bay National Wildlife Refuge Complex, with funding from the San Francisco Bay Wildlife Society. 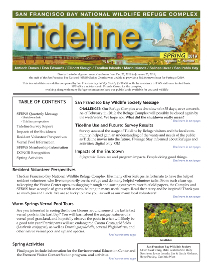 If you would like to receive an email notification when the next issue of Tideline is published, or receive a hard copy in the mail, please send an email to carmen_leong-minch@fws.gov and indicate whether you would like email notification or a hard copy mailed to you. All issues of Tideline dating back to 2003 are available below.